Lemons can be found in most American homes these days. From fresh and frozen, to their essence in cleaning supplies and beauty products, the diversity of these bright, tangy, tart, yellow fruits is limitless. And, thanks to the Mediterranean like climates of California and Arizona, lemons are available throughout the year, accounting for 95% of the U.S. lemon production. Originally found in Northern India, and prized for their unique flavor, lemons enhance culinary delights around the world, and were once referred to as the “golden apple”. A bowl of fresh lemons will add fragrance and color to a room for days. Add a slice or two of fresh lemon to a glass of water. It has visual appeal and makes the water taste and smell better. If you are reducing your sodium or fat intake, try squeezing a wedge of fresh lemon on salads, steamed vegetables, soups and stews. You’ll never miss the salt or butter! Add the grated zest of fresh lemon to recipes for added intensity in cakes and cookies. Sooth a sore throat by mixing lemon juice and honey with hot water. Freshen and moisturize the air in your home on dry winter days. Place an enameled cast-iron pot or bowl on top of your wood-burning stove or stovetop, fill with water, and add lemon (and/or orange) peels, cinnamon sticks, cloves, and apple skins, and just simmer the water periodically. Neutralize cat-box odors, by cutting a couple of lemons in half and placing them cut side up, in a dish in the room, and the air will soon smell lemon-fresh. BUT — even with all the attributes of this small oval fruit, my favorite use is still in Lemon Poppy Seed Muffins and a fiery Lemon-Rosemary Roasted Chicken. Check out the recipes below to make these treats for your family. Preheat oven to 400 degrees. Grease the cups of a 12-cup muffin tin with butter. In a mixing bowl, sift the flour and then add the remaining dry ingredients. Stir to combine. In a small bowl, whisk the eggs lightly. Add the milk/yoghurt, lemon zest and cooking oil and stir together. Make a well in the flour mixture and pour all of the milk and egg mixture into the well. Stir as little as possible to moisten the flour. Set the batter aside for a minute. Spoon the batter into the prepared muffin tin. Bake on a rack in the middle position of the oven for 20 minutes or until golden brown on top. Remove from the oven and let sit while you prepare the topping. Melt the butter in a small pan. Put the sugar and remaining lemon zest in a small bowl. Mix the sugar and lemon zest together well. Run a knife around the edges of each muffin. Remove muffins from the tin one at a time. 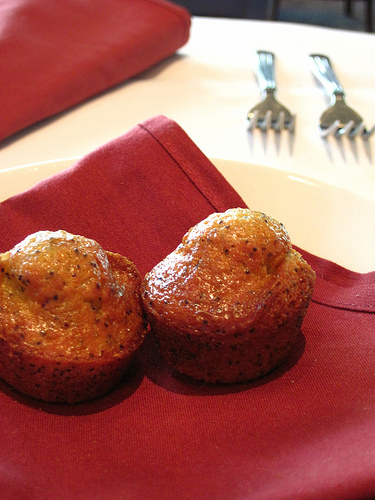 Brush the top of each muffin with melted butter and then dip it in the sugar and lemon zest mixture. Place muffins on a rack to cool completely. Preheat oven to 350°. Set chicken in a roasting pan. Using a vegetable peeler, peel long strips of zest from the lemon, making sure to avoid the bitter white pith. Set zest aside. Roll lemon on counter to release more of the juice, then cut in half and squeeze juice all over chicken. Reserve remaining half. In a small bowl, combine chopped rosemary, minced garlic, red pepper, black pepper, 1 tsp salt and olive oil. Rub mixture over chicken. 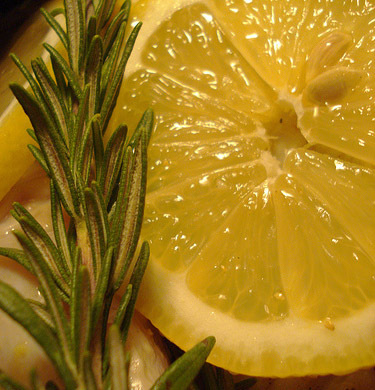 Scatter smashed garlic, zest strips and rosemary sprigs around chicken. Put into oven. Roast until chicken is done and juices run clear. **If you like you can toss quartered red potatoes in olive oil and place around the pan and roast along with the chicken. The potatoes will pick up the flavors of the rub. With these lemony recipes your house will smell as fresh and cool as a spring breeze—all winter long.